No matter the precautions we take, sometimes circumstances just dictate spending extended periods of time out in the wilderness. Of course, for some of us, we prefer spending long stretches out in the wild even when circumstances don’t dictate it. Either way, the fact is that having the right knife to meet your daily challenges out there can be the difference between thriving and just barely surviving. In this article, we share with you all the aspects you should consider to pick the best bushcraft knife for your needs. Click on one of the links to go directly to our overview, opinion, and features of each knife. If we think of bushcraft in its purest sense, then there are three basic jobs where we are going to need a knife: 1) Building some type of shelter; 2) Starting a fire; 3) Catching and preparing food. That means you would optimally have a knife that is precise and comfortable enough to do fine work like feathering or skinning, sturdy enough to chop firewood and baton it, and a good enough wood slicer to carve spears, stakes, frog gigs, etc. A fixed blade knife is one where the blade does not move in relation to the handle, as opposed to a folding or pocket knife. Fixed blades are generally considered superior for bushcraft because the absence of moving parts means there are fewer ways the knife can malfunction. Additionally, the fixed blade is just a stronger knife for the sometimes-rugged work of bushcraft. This term refers to a fixed blade knife where a single piece of steel makes up both the blade and the portion of the knife that the handle is affixed to. It is preferred because it is a more durable design. There are two basic types of steel when it comes to bushcraft knives, stainless and high-carbon (HC). Which one you use is going to depend both on your personal preference and possibly your environment. Stainless steel has a high chromium content, which makes it corrosion resistance, but also softer. Although easier to sharpen, stainless steel blades will not retain an edge as long as HC. If you consider the fact that diamonds are pure carbon, it will be easier to remember that HC knives are harder than stainless. These blades retain their edge better and are more durable. However, they can be challenging to sharpen when they do get dull, especially in the field. Also, extra care must be taken to ensure that they do not rust in a wet or high humidity environment. What is the best grind? The grind refers to how the blade has been shaped above the cutting edge. It can have a significant influence on several aspects of the knife related to performance and maintenance. For bushcraft knives, the grind should make the blade both strong and versatile, but it also must be easy enough to sharpen in the field. In many instances, a Scandi grind can be preferable because it makes for a great wood carving knife and is easy to sharpen. Some, however, prefer a flat grind because they feel it is stronger and stands up to jobs such as batoning better. What is the best blade shape? Key to blade shape is having a long, flat cutting edge that turns up to meet the tip. Shapes like the Clip Point should be avoided because it leaves the tip too thin and weak. Bushcraft tasks like boring holes (and many others) mean that you will be putting the tip through rigorous use. Both the Drop Point and Spear Point profiles work well for these purposes. They allow for a large cutting surface that is good for both slicing and chopping, and also maintain a strong tip that is easily controllable. What is the best blade size? Resist the urge to go too big when it comes to a bushcraft knife. Not only can it become cumbersome to carry, but it also will not be nimble enough to get some jobs done. A good range to stay in is between 3”-6”, with 4”-5” probably being the sweet spot. What is the ideal blade thickness? You will need something that has both strength and versatility. Thinner blades will generally make much better slicing knives and perform precision cuts easier. Meanwhile, thick blades will stand up to more of a beating. If you plan on having an ax or machete along with you, then a .125” (3.2mm) thickness will be sufficient for your needs. However, if you want to ensure that you have a knife that can replace an ax if need be, then you can go as thick as .2” (5mm) in some cases, yet still have a knife that adequately performs your more delicate bushcraft jobs. What are the best handle materials for a bushcraft knife? Again this will depend on what jobs you want to perform. However, bushcraft handles tend to be less focused on being “grippy” like tactical knives, and more toward having great ergonomics. What is the best sheath material to protect your bushcraft knife? Many bushcraft knives still use leather sheaths, which are fine and work well for what they are. However, the thermoplastic sheaths like Kydex tend to offer greater functionality and versatility, with comparable durability. Some bushcraft knives come with Nylon sheaths, but typically these do not withstand difficult conditions. Morakniv is a Swedish knife manufacturer that has been in business since 1891. The company’s reputation is built primarily on its association with the Swedish military, and also for making razor-sharp knives that are highly affordable. The Morakniv Companion is a very solid light-to-medium-duty bushcraft knife that weighs in at 4.8oz (135g). It is a ¾-tang with a 4.1” (10.4cm) blade that has a Scandi grind. It is made out of 12C27 stainless steel, which is respectable steel that tends to hold its edge well. The blade thickness is .125” (3.2mm). One of the drawbacks to the Companion, and one of the big complaints about Moras in general, is that the sheath is not highly functional. It is molded plastic and does fine for the basic job of storing the knife. However, the belt loop is small and might not work very well with a tactical, belt. Also, there is a danger of losing the knife when picking your way through rugged terrain. Other than this criticism of the sheath, the Companion is a great value for the money. With its thin blade and razor edge, it is a fantastic slicing knife that performs delicate cuts with ease. Mora also did a great job with the handle ergonomics, as it feels very intuitive in your hand. The grip is described as “high friction,” and I have to say that is an apt term. The knife holds very well even in wet conditions. Condor Tool and Knife traces its history back to 1787 with the founding of the Gerb Weyesberg Company in Solingen, Germany. In 1964, the company established operations in El Salvador and that is where the Bushlore is manufactured today. One of the distinctive features of the Bushlore is its walnut handle. Aside from looking good, it has a well-designed palm swell, and is very comfortable when making detailed cuts. The knife also comes with a high quality, thick leather sheath that is solidly built. Its belt loop is a good size and heavy-duty. The blade on the Bushlore is 1075 HC, which is a good grade for this price point. The blade length is 4.3” (10.95cm) and the thickness is .125” (3.2mm). It is a Drop Point profile with a Scandi grind and plain blade. This full tang bushcraft knife also has an overall length of 10.5” (26.67cm). It weighs in at 12.8oz (362.9g). This Bushlore is maybe not the slicer that the Mora Companion is. It does detailed cuts well, just not with the same ease. This may be the difference between the Mora’s 12C27 steel and the Bushlore’s 1075, as you will notice that the Bushlore is not as sharp out of the box as the Companion. However, the Bushlore is a heavier knife, weighing nearly three times as much as the Companion. This combined with its full tang construction means that it is going to stand up to much more rugged use. The Bushlore is a solid wood processor when it comes to medium-duty batoning, and also works very well as a chopping knife. All in all, the Condor Bushlore is a great option for a bushcraft knife at a price that we think gives you a stellar product for your money. The Frontier is a Taiwanese-made knife with a coated 1095 HC steel blade. It is full tang and has a 90-degree spine that works well for striking a ferro rod. The blade itself is 5.05” (12.8cm), with a solid thickness of .22” (5.58mm). It has a Drop Point profile with a hollow grind, and the blade features a finger choil. The Frontier’s handle is made of TPE (Thermoplastic Elastomer). It has a contoured design with ring texturing for a solid grip. The handle also features a lanyard hole and aggressive jimping on the spine and underside. In addition, this bushcraft knife comes with a black nylon sheath that includes a storage compartment, sharpening stone, and ferro rod. The Frontier’s spine thickness will allow it stand up to heavy-duty tasks like batoning well. Basically, whatever you can get the blade across you will be able to effectively baton. It also has the weight for chopping small-to-medium diameter wood. Yet the hollow grind gives it a very fine edge that allows the Frontier to perform detailed cuts very well. Two big criticisms of this knife beginning with the sheath, which is likely going to wear out on you pretty quickly. Also, the handle is not a very comfortable design. The jimping is so aggressive that it can be painful when chopping, even with gloves on. However, if you are in the market for something that is compact, heavy-duty and comes in at a reasonable price, the Frontier can be difficult to top. The Bushcraft is a knife that has some really nice features for such a reasonable price. Its D2 steel blade, Kydex sheath, and G10 handle make it a really solid overall package. The Bushcraft is full tang. Its blade is 4.13” (10.5cm) long with a Scandi grind. Blade thickness is .14” (3.5mm). It has a Drop Point profile and features jimping along the spine. The overall length is 8.62” (21.9cm) and the knife weighs 5.8oz (164.4g). It terms of the handle, it has a good ergonomic feel to it, thanks to some well-executed contouring. The ambidextrous Kydex sheath is drilled out beneath the belt attachment so that it can be positioned for just about any type of carry. The sheath also features a drainage hole and carries the knife snuggly, with no real rattle. One of the drawbacks to the Real Steel Bushcraft Knife is that quality control can be a bit of an issue. You may see some inconsistencies in the finishing of the blade. You might also notice that the pommel is a little bit sharp around the edges, which can be uncomfortable in some gripping positions. Other than that, the Real Steel Bushcraft will perform very well in most of your camping and light-to-medium-duty bushcraft jobs. The blade is durable, has good edge retention, and comes extremely sharp out of the box. With a few exceptions, the handle gives the knife a very solid feel. The Becker BK16 is a Made in the USA full tang bushcraft knife. The blade has a full flat grind and Drop Point profile. It is 4.375” (11.11cm) in length and has a thickness of .165” (4.2mm). It is made with a high carbon stainless known as 1095 Cro-Van that is treated to RC 56-58. The overall length is 9.25” (23.5cm) and it weighs 6.4oz (181.4g). The handle material is a Nylon-based polymer called Ultramid®. It is very comfortable in all gripping positions. The handle also features a lanyard hole and exposed tang on the pommel for hammering. The sheath is made of Cordura fabric and features two snap-overs to hold the knife in place. It is MOLLE compatible, has grommets for leg lashings, and also a Velcro belt loop. The full flat grind makes the BK16 a very good slicing knife. The 1095 Cro-Van also allows for very easy sharpening and puts the BK16 in the low maintenance category. Overall, this is a very good camp knife and bushcraft knife for the money. It does most any task very well. There are a few items on the downside for the BK16. In spite of the sheath’s features, neither the material nor the stitching is very high quality. Also, although the handle does have very nice ergonomics, the material is not the grippiest when it comes to wet conditions. Overall, however, this is a very solid bushcraft knife. The RAT-3 is a full tang U.S. made knife. 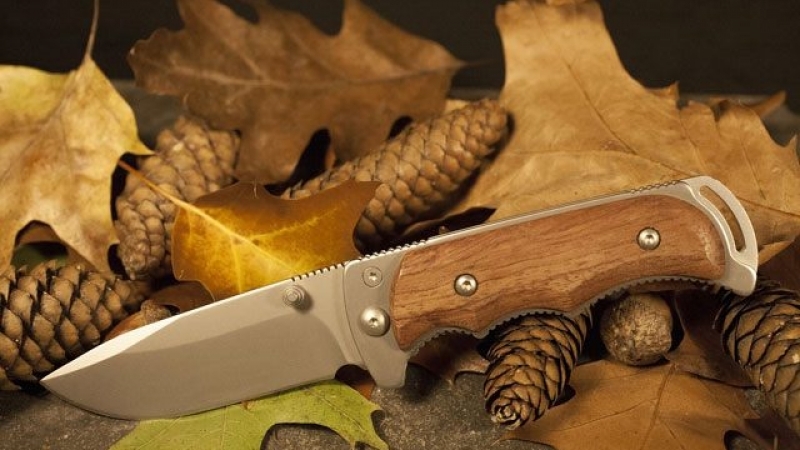 The RAT in the name stands for Randall Adventure Training, as Jeff Randall designed the knife for Ontario before beginning his relationship with ESEE. The RAT-3’s blade is 1095 carbon steel with an epoxy powder coat. You will find that the blade is a little on the small side with a length of 3.5” (8.89cm), and a thickness of .125” (3.2mm). It is a Drop Point with a full flat grind and jimping along the spine. The RAT-3 weighs 5.oz (150.2g). The MICARTA handle on this knife is 4.3” (10.9cm) long and features a lanyard hole. The material is scaled and feels very smooth, yet it has a solid grip once you really grab hold of it. The sheath is a thermoplastic that is very similar to Kydex in terms of performance. It has a drainage hole and several grommets for multiple lashing configurations. The RAT-3 makes for a great camping and light-duty bushcraft knife. It is capable of very precise cutting, and feels very comfortable when doing so. The jimping is executed very well and really gives your thumb something to comfortably dig into when up on the spine. The sheath is also a selling point, as it holds the knife very securely and comes with a nice Teklock carry mechanism that is MOLLE compatible. One drawback to the RAT-3 is the fact that the 1095 does not have the highest standard of heat treating. Consequently, the edge retention and durability are somewhat lacking, even though the knife does come very sharp from the factory. Benchmade is a knife manufacturer based out of Oregon City, Oregon that has built a solid reputation for making innovative knives and using great materials. The Bushcrafter is no exception to this level of quality. The Bushcrafter has a 4.4” (11.18cm) blade. The spine of the blade is 90-degrees and makes for good ferro rod striking. Its thickness is .164” (4.17mm). The blade also has a Drop Point profile and is S30V steel that is treated to RC 58-60. The G-10 handle on the Bushcrafter is quite comfortable. It is 4.75” (12.07cm) in length, and is a good fit even for larger hands. The leather sheath for this knife has a snap-over retention system, a side compartment for carrying a fire steel, and a D-ring loop for different carry configurations. The S30V steel means that this is going to be extremely sharp and durable blade, which will also retain an edge very well. The knife handles precision cuts with minimal effort. It also processes small and medium-sized firewood, in terms of chopping and batoning, quite efficiently. It basically does everything you need to build a fire from the ground up, making it an all-around solid bushcraft knife worth considering. For some, the sharpness of the spine might be a drawback. When placing the thumb higher up on it for precision cuts, it does tend to dig into the skin. There are also some complaints when it comes to the sheath that it is not secure as it could be. You will have to examine it for yourself when purchasing to see if it is going to be an issue for you. The RB3 is part of ESEE’s Camp-Lore lineup of knives. These were designed to be non-coated, ergonomic knives, unlike ESEE’s more tactical knives. The RB3 is also ESEE’s first Scandi grind. This knife is 6oz (170.1g) and has an overall length of 8.3” (20.6cm). The Drop Point blade is 3.5” (8.9cm) in length, has a .125” thickness (3.2mm), and is made of 1095 HC steel. The spine is 90-degrees for effective ferro rod striking. The 4.63” (11.8cm) handle is MICARTA. It is rounded with great contouring, making it very comfortable to use. The scaled MICARTA also makes for a very grippy surface. In addition, the RB3 comes with a quality leather sheath that secures the knife well and features a drainage hole. The RB3 is an excellent wood carving knife which makes it an interesting option to consider as a bushcraft knife. Precision cuts are no problem for this knife either, both in terms of the blade and the ergonomics. You will be pleasantly surprised at how natural the knife feels in your hand compared to other ESEE knives, which can tend to feel a bit blocky. The grind is a true Scandi, rather than some of the modified versions that are out there. It makes for a great slicer, but may not be the best for some more delicate operations like food preparation. Also, although this knife can process firewood adequately, that is not its designed purpose. Spyderco is a company with a great reputation in the knife world. If you are not familiar with their products, you can begin to understand why they are so highly thought of just by opening the box to one of their knives. The packaging is done with great care and attention to detail. As far as the knives themselves go, the Bushcraft G-10 is a Scandi grind with a 4.1” (10.4cm) blade made of O1 steel. The overall length of the knife is 8.75” (22.2cm). Its weight is 7.8oz (221g). As the name implies, the handle is made of G-10. It grips very well, has good ergonomics, and also features a lanyard hole in the bottom. It comes with a high-quality leather sheath that has six grommets for multiple carrying configurations. The sheath also features a small plastic cap that the point of the knife inserts into to keep it from cutting up the leather. The details of the Bushcraft G-10 are impressive and it will perform very well for you in the field. The blade holds up well under rugged use, both in terms of edge retention and showing no signs of rolling or chipping. However, you will see this knife really shine when slicing and making delicate cuts such as feathering. It handles these tasks with great ease and comfort. No knife is perfect for everyone, and maybe the blade could be a bit longer on this one, but overall there are very few drawbacks when it comes to the Bushcraft. The B.O.B. Fieldcraft is a U.S. made, full tang knife, weighing in at 9.6oz (272g). The overall length of this knife is 10” (26.67cm), and the length on the Drop Point blade is 4.75” (12.1cm). Tops used 1095 HC that is treated to an RC of 56-58. Blade thickness is .19” (4.8mm). Some other features are jimping along the spine, a finger choil and black coating on the blade. The grind is a modified Scandi. This knife has a MICARTA handle that is 5.25” (13.4cm) long and features both a lanyard hole and bow drill divot. Although the spine of the knife is not quite sharp enough for sparking a fire steel, the pommel does have a feature that is specially designed for striking one. The B.O.B. comes with a Kydex sheath that includes a fire steel and a whistle. The fit of the knife within the sheath is very firm, with no rattling. It also has a rotating clip for multiple types of carry. This knife strikes a good balance between being hefty enough for doing rugged work, like chopping and batoning, but is not so bulky as to be cumbersome. In many ways, it really finds the sweet spot of what a bushcraft knife should be. It is very comfortable to use, the Scandi grind is great for working with wood, and it offers a lot of features that can potentially be life-savers in a wilderness setting. Finding the right bushcraft knife for your particular needs will take some time and research. 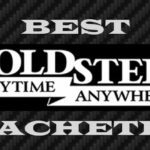 Not only are there many excellent choices available, but you will also have to consider things such as your budget, your environment, and what specific jobs you want a knife to accomplish. It may be the case that one of the under $50 selections will fill your niche perfectly, or you may need something that can stand up to heavy-duty use over an extended period of time. Whatever your situation might be, we would greatly appreciate hearing your questions, recommendations, or experiences. Leave a comment below and let us know what is on your mind.